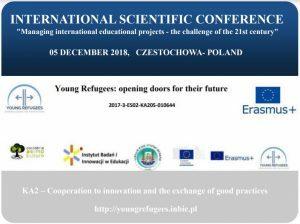 The objective of this strategic partnership is, through the exchange of good practices, is to discover advanced tools which tackle some of the refugees needs that live in Europe, with special regard for those originating from Syria. 1.Enhanced their insight about the displaced people’s circumstance in the three nations included, including the location of their principle needs. 2.Adapted new procedures to convey business enterprise to youth and youthful displaced people. 3.Learned, rehearsed and demonstrated to accomplishment in activity layout and usage. The normal effect of the project incorporates a superior learning and attention to the truth of the youthful evacuees living in Europe. Participants will also have their entrepreneurial abilities reinforced in the regions of project application, gather help, initiative, looking for financing and utilization of new advancements, in addition to other things. The consequences of our staff’s ability building will be reflected in the formation of higher quality projects in general, and in the production of a particular K2 project that will be submitted in 2020 (now October 2019). (a)The acknowledgment of two transnational meetings, in which the working arrangement will be reviewed and we will assess the current situation of the project. M1. Introduction to the project design. M5. Partners’ experience with refugees and digital tools. M6. From planning to action. Before the activities start, participants will be called in to at least two meetings. 1.The first meeting will be informative. It will review the project and how they can participate in it. They will also be given the documentation about the project (the proposal, the learning objectives established for each activity, the info pack prepared for the other entities if this is ready) so that they can study it calmly, and a file to fill in with their data to be able to manage the purchase of their tickets. In addition, they will be given a hands-on demonstration to learn how to use the free language learning platform “50 languages”, so that they can become self-taught in English (the working language) or in Spanish. Finally, it will focus on their responsibilities and tasks, having to sign, at the end, a commitment document that ensures active and quality participation by each participant. 2.Three months after the kick off meeting, there will be a follow-up meeting with the participants to review the progress and possible difficulties that have arisen in the performance of their tasks. Participants will receive all the practical information that they need to know, in order to guarantee a pleasant stay, during the activities (objects they should bring, a description of the situations they may encounter and of the accommodation place, etc). They will also be asked to prepare the necessary material to take part in the exchanging activities. This will allow the participants to play an active role during the visit and the training course. 3. The final evaluation meeting with the participants on the activities will take place during the training course in Spain, so that their impressions can be gathered before the end of the course. Participants will also be encouraged to participate in the new project writing that will be done in the next year. -Youthpass: Permacultura Cantabria will contact participants, six months after the activity, in order to check if they printed the certificate. If they didn’t do it in their organisations, they will send a certificate, offering them the possibility to fill it, whenever they want. -Europass Language Passport: As one of our needs is that our staff work on their language skills, we also plan to encourage participants to create and fill out the Europass Language Passport after the learning activities, which is available on the Europass website. 1.Project coordinator: financial, schedule and quality control, as well as reporting. 2.Preparation and implementation of the course and the final meeting in Spain (maybe a conference). – Oscar Argumosa: President of Permacultura Cantabria. He is an entrepreneur, founding two NGO’s (Permacultura Cantabria and PASOS) and an architecture SME (Bitectura). In the last three years he has created the electronic platform “Reserve-me” (https://reserve-me.com/) for the dissemination of training, leisure and wellbeing activities, he has designed and rolled out a Master in Emotional Management; and has coordinated more than 21 European projects. He is also a guest speaker to a number of universities and regularly collaborates in developing social programs with local institutions. In this project, he will design and coordinate the training course in Spain. He will be the spoken person in the conference. – Carmen Solla: International Area Coordinator of Permacultura Cantabria. 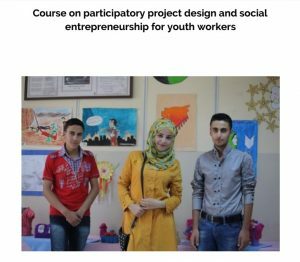 As coordinator of the Interculturality and Education for the Sustainable Development Area of “Save the Children”, she designed and monitored different international cooperation projects to promote youth and children inclusion, especially of those with migrant backgrounds. For example, the project “Me, my neighborhood and the world” was designed to improve the intercultural coexistence among at-risk adolescents. She will be the contact person in this project and will be in charge of its implementation. She will also attend the transnational meetings, participating in the writing of the report and the new k2 project. – Leila Bensghaiyar: Responsible for dissemination (She won’t participate at the end, so Carmen Solla will be in charge of the dissemination). – Julia Ramos. She has a Master in Leadership and Strategy Sustainable Planning she studied in Technique University of Sweden. Entrepreneur of “Once in a LifeTime Events”, project that lead to integrate sustainability in event organization. She has 8 years of experience in Hotel Business and a Master in Communication Management and Public Relations. She will be facilitator in the entrepreneurship course in Spain. – Beatriz Gallego. She is a creative entrepreneur at 14 grapas.com. A trainer and teamwork facilitator and a Psychologist oriented in processes. She has got 14 years of experience in communication and marketing for the private, and social sectors. She has an MBA and experience in cooperatives organisations. She will be the facilitator in the entrepreneurship course in Spain. – Silvia Abascal: During the course, she will be responsible for simultaneous translations and support to the coordinator. – Angie Larenas Álvarez. She is a sociologist specialised in social research with specific training in international studies. She has more than 10 years of experience as a researcher, trainer and editor to different organisations and institutions. One of her most recent jobs was related to the process of welcoming and integrating refugees in the Basque Country, Spain. To develop that work she has collaborated with the University of Deusto (Bilbao). She has many publications concerning human rights, international relationships, humanitarian action and migration. She will be one of the trainers in the course and will be the accompanying person of the participants in the programmed visits. She was not included in the application, but she will participate in the project. 2.Experience about digital tools (develop the tool if the new k2 project is approved, suggest a new partner to do it or subcontract one). -Renata Ochoa-Daderska: contact person, in charge of the Project implementation. -Malgorzata Brinska, second person that will help to the contact person. -Luis Ochoa Siguencia PhD. Expert in new technologies. 1.To lead the writing of the report. – Second person: Mustafa Deveci. Director. *Each partner must report their expenses at the end of each month with supporting documents (scanned invoices issued to their organisation) to Permacultura Cantabria. Thus, we can plan possible revisions between budget items. *Original documents may be requested during the controls, the Partner is liable to submit original copies of the documents and to keep accounting reports. The Commission may carry out inspections or evaluations within 3 years as of the date of application of the contract and the date on which the person is paid (as the total budget doesn’t exceed EUR 60 000). *Partners are allowed to adjust the estimated budget by transfers between the different budget categories. The Coordinator and the Partners are allowed to transfer up to 20% of the funds allocated for project management and transnational project meetings, intellectual outputs, multiplier activities, learning/teaching/training activities and exceptional costs to any budget category except project management and implementation costs and exceptional costs. *The Project starts on 9th April 2018 and finishes on 8th October 2019 (18 months). * By 8th February 2019 the coordinator must complete an interim report on the implementation of the Project covering the reporting period from the beginning of the implementation to 8th January 2019. *All requests for payments and reports must be submitted in Spanish. – For travel taking place between the sending organisation and the receiving organisation: proof of attendance of the activity in the form of a declaration signed by the receiving organisation (attendance certificate in annexes). – If one of the people chosen to participate in the learning activities does not attend the meetings, does not sign the commitment to participate, does not perform their tasks on time or otherwise breaches their obligations. This person will be notified in writing of his / her departure as a participant in the activities and a substitute will be sought as soon as possible. – One of the participants does not obtain the European Health Card before the learning activity begins. The contact person of each entity will personally supervise that this occurs on time. – If one of the participants in the learning activities incurs a serious misconduct during their stay in another country (such as disrespect for another person or endangerment of themselves or their peers). The contact person of the host entity will notify the events immediately to the sending entity. In addition, the management or contact person of the host institution may decide to expel the participant from the activity. – If one of the partners stops cooperating or leaves the project. In this case, the problem will be immediately notified to the national agency by email, and if there is no response within a week, it will be notified by telephone to obtain information about how to proceed. The internal agreement between partners also establish that if a partner entity leaves the project, they should pay back the used funds. – If some of the participants are late in carrying out the agreed tasks. The contact person of such organisation will be contacted to know the reasons for the delay or if the participant needs help (the same will be done if the person who is late is the contact person). If there is no response during one week, a notice will be sent by email, warning that, in another week, the fact will be communicated to the national agency where the project was presented and in the country to which the participant being late belongs. – If the applicant delays payments to the rest of the entities. When an unjustified cause occurs, the partners will notify to the national agency where the project was submitted, in case of more than one month delay. – If the contact persons do not send the invoices to the applicant, at the end of the project. If the cause is not justified, the applicant will delay the last payment to the organisation until receiving the invoices. If the conflict prevention was not enough, and the parties did not reach an agreement for themselves, a vote between the best available options would be established, choosing the one with the majority of votes. In the event of a tied vote, the vote of the coordinating organisation, would be double-counted. All the parties would be aware of this resolution conflict measure and it will be reiterated in the previous meeting, so as to dispose them to a better understanding of this procedure and each other, during the project. During that meeting, the number of people being able to vote will be agreed upon, in the case of conflicts. – 75% if the final report scores below 25 points. The Partner notifies the Coordinator immediately in case of appearance of any situation that may affect the performance of the Contract of Partnership. The Coordinator may cancel the Contract of Partnership on the condition to preserve all rights for damages through a notification to the Partner. In case of occurrence of any of the conditions that shall require termination of the Contract which is set out in Article 2 of the Grant Contract in Annex 1, this contract will be terminated.